Where do the Market Roads originate from? Where did the Bend Logo come from? 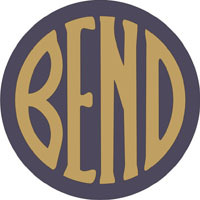 The Bend Logo, the name BEND in a circle, was created 100 years ago as the signature trademark of the Bend Emblem Club. The Emblem was the original logo of William D. Cheney’s Bend Park Company, a development endeavor to help further Bend’s growth. On the night of January 4, 1913, during a party hosted at the home of Bend’s mayor and Bend Bulletin publisher, George Putnam, the Bend Emblem Club was officially created. In attendance were Clyde McKay and James Overturf, as well as many of Bend’s other prominent citizens. The Emblem Club members swore an oath to promote and display the logo until a time when the town of Bend reached a population of 100,000. Visitors and residents can still view remnants of this oath in the windows of many of the historical buildings around town. The Bend Emblem Club officially disbanded in 1924. The Bend Commercial Club and later the Chamber of Commerce took over recruiting businesses to Bend. However, the group’s legacy lives on with the popularity of the logo and the sense of belonging one receives through its recognition. Why is the Old Mill called the Old Mill? The lumber mills made up a big part of the history of this region and evidence of this industry can still be found among the shops and along the river of the Old Mill District today. The Old Mill District incorporates the sites of two mill companies, Brooks-Scanlon Company and Shevlin-Hixon Company. Visit the Les Schwab Amphitheater on the West side of the river and you are standing on the site of Shevlin-Hixon’s Mill. The mill opened in 1916 and operated into the 1950’s. Brooks-Scanlon’s Powerhouse B building now is home to REI. Also beginning operations in 1916, this mill bought Shevlin-Hixon Company in the 1950’s and continued their operations into the 1990’s. During the early 20th century, both Mills were counted as the largest Yellow Pine producers in the world, producing over 600,000 board feet of lumber a day and employing over 1,500 men and women in both mill and lumber camps. In 1993, the mill district began redevelopment under the direction of Bill Smith and an initial acquisition of 270 acres of riverfront property. The original smoke stacks and powerhouse locations, from the Brooks-Scanlon Company, were saved and restored, now presenting a unique backdrop to the Old Mill District. The first retailers opened for business in 2000. Today the Old Mill is a popular site for both shopping and recreation in Bend. Where was the Pilot Butte Inn? Located on the corner of Wall Street and Newport Avenue, the majestic lodge-like building opened its doors to the public on March 17, 1917 – St. Patrick’s Day. The Pilot Butte Inn incorporated both wood and stone, creating multiple expansions stretching the building’s capacity to over 150 rooms. It sported a large walk-in stone fireplace and hosted many prestigious guests, including Eleanor Roosevelt, Herbert Hoover and Ty Cobb. Sadly, in the 1960’s, the Inn fell onto hard times and by 1970 the Pilot Butte Inn was left dilapidated and abandoned. On June 20, 1973, the Pilot Butte Inn was torn down. In all actuality, there have been three Pilot Butte Inns in Bend. The first Pilot Butte Inn was built in 1902 by the famed A.M. Drake, who Drake Park is named for. It was an all wood building, located on the corner of Newport Ave. and Wall St. Then, in 1904, another hotel was built using the same name. This second Pilot Butte Inn was located just north of the original. This new Inn was renamed the Colonial Inn in 1917 and was finally torn down in 1968. What was the Deschutes River Railroad War? The Deschutes River Railroad War refers to the historical competition to build the first operational railroad connecting the vast resources of Central Oregon to the prominent railroad lines of the Columbia River Valley. James Hill’s Oregon Trunk Railway and E.H. Harriman’s Des Chutes Railroad were fiercely competitive, which carried over to the thousands of men in their employment. From the time construction began in The Dalles, Oregon (1909), each of the two camps worked to sabotage the efforts of the other. The war involved land grabs, right of way refusals, intimidation, vandalism, arson and murder. Neither side of the Deschutes River was safe as each railroad company raced to be the first to reach Bend, Oregon. Following the death of E.H. Harriman, and seeing the futility of the competition between the two companies, Hill and the new head of Des Chutes Railroad signed an agreement for joint use of portions of the track, bringing the fighting to an end. Finally, on October 5, 1911, James Hill drove in the ceremonial golden spike at the Bend rail depot, signifying the completion of the Oregon Trunk Railway line. Both rail companies would operate service into and out of the Central Oregon area for years to come. Are there such things as Lava Bears? The legend of the “Lava Bear,” Central Oregon’s very own mythical creature, has been around for many years. First identified by author and humorist Irvin S. Cobb during the 1920’s, the existence of the “Lava Bear” became the subject of a much talked about hunt. The first live bear was caught by former government trapper Alfred Andrews in 1924, who was part of the original hunt organized by Cobb. The “Lava Bear” turned out to be nothing more than a diminutive and malnourished black bear. Although the actual existence of a “Lava Bear” may be under under speculation, its namesake has lived on as Bend High School’s mascot, since 1930. For more information about the “Lava Bear” legend, pick up a copy of the Museum’s February 2012 issue of the Homesteader. Did Amelia Earhart ever live in Central Oregon? No. She does however have a connection with the area. In 1931, Amelia married her publicist, George Palmer Putnam, of Putnam & Sons Publishing. 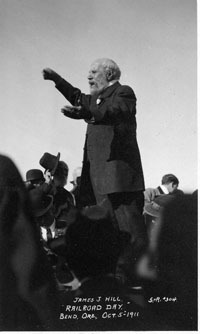 Putnam had been a prominent community member of the Central Oregon town of Bend. Arriving in the small town in 1909 he quickly became the editor and publisher of the local newspaper, the Bend Bulletin, he was an original member of the Bend Emblem Club, and served as the town’s youngest mayor in 1912. During the same year the Oregon Trunk Line arrived in Bend, Putnam, now a newlywed, introduced his first wife, Dorothy Binney (of Binney & Smith Crayola Crayons), to his western home. 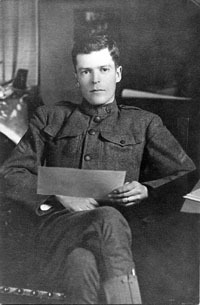 It wasn’t until 1919, with the death of George’s father, that George moved his family to New York, selling his interests in the Bend Bulletin and his home, to take over the family publishing company. In 1929 he divorced Dorothy upon her request, and two years later he married Amelia Earhart. Why don't we elect our mayor in Bend? The City of Bend operates under a council-manager form of government. We have 7 elected councilors who appoint a mayor for a 2 year term from within their ranks. The council is vested with all legislative powers of the City of Bend, as well as the right to appoint the city manager and other offices within the city government. The mayor presides over the council meetings, enforces council rules and signs all ordinances, resolutions, and other official documents. The city manager is appointed by the city council to serve as the administrative head of the city government. The manager executes and administers all ordinances of the council, manages the city budget, advises the council on the affairs and needs of the city, and supervises the operation of the city. The city manager attends the council meetings, but is not a voting member. The City of Bend adopted this council-manager form of government in a special election held on October 16, 1928. The new charter passed by a vote of 989 to 702. At the time, the councilors were referred to as commissioners and there were only 3, not 7. George P. Gove became the first mayor appointed from the commissioners, and C.G. Reiter was hired as our first city manager. A new city charter was approved by vote on November 8, 1960. This charter incorporated many of the small changes and amendments that had been made to the town charter over the previous 30 years, including the change from 3 commissioners to 7. Our current charter, the City of Bend Charter of 1995 was approved by voters on May 16th, 1995. This charter streamlined much of the previous charter and also changed the title of our commissioners back to city councilors.